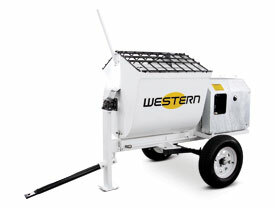 Plaster/Mortar Hydraulic 1200 Mixers - Western Equipment Manufacturing, Inc.
All the features and quality of our mechanical 1200 Mixer with a heavy duty low maintenance hydraulic system that gets rid of Clutch and Transmission while bringing the reliability and added features of Hydraulics. Stronger engine options allows for higher mixing torque. Reversible drive for safe & quick release of jams. Pressure release valve to prevent damage in case of jam.